It's JenMarie's turn to host Limelight's 9th Day of Christmas, so head over and see what she's got for you! 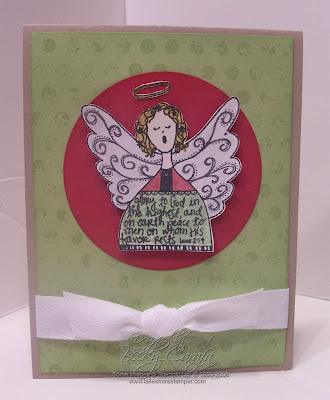 And a card: it's been a few days since I've been able to stamp, but Sunday afternoon I was able to get this done. I've been dying to get the Unity distressed dots background, and guess what? My Unity secret santa Lisa got it for me, woohoo! And the Unity Luke 2:14 Angel came to me last week also, so I paired them up. I also sponged around the celery and rose red layers and used various Shimmerz paints on the angel so she really sparkles! All these stamps and embellishments are available at Limelight. The background combination with the image is fantastic Becky! The two are a match made in heaven :) I can't wait to ink up my little angel too.